Chhattisgarh Professional Examination Board Chhattisgarh invited the Candidates to Fulfill the Recruitment of 213 Posts of Sahayak Vistar Vikash Adhikari/ Assistant Development Expansion Officer (ADEO). A large number of interested Candidates filled there Online Application Form. The Process of Submitting Online Application Form was 22-09-2017. Candidates Can Check the Detailed Recruitment from the Below Provided Link. All the Candidates who filled the Application form and gave the exam of CG Vyapam ADEO Exam. The Exam was Written Objective Type and which was Conducted on the date 29 October 2017. The Exam was of Total 150 Marks/ Questions. The Time Duration for the Examination will be 03 Hours. There was a Negative marking of 0.25 Marks for each Wrong Answer. All the Candidates who gave the exam of CG Vyapam ADEO are excited to know the result of their exam. Many Candidates start searching about there Result. So here we are going to tell you that those Candidates have Some Patience Soon the CG Vyapam will announce the result of ADEO on his Official website. Candidates who applied for this Exam, stay tuned with the official website cgvyapam.choice.gov.in The result will declared soon. Also we Will Provide the Direct link to Download the Result to our Candidates So that the Candidates Can Download there Result. The Candidates can get any kind of alert easily from Our Website (www.jobriya.in) for this the candidates need to Bookmark us by pressing Ctrl+D regarding the admit card, result and other related information. 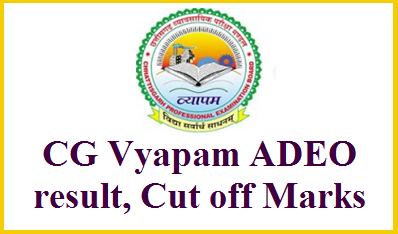 Latest Updated on 12.06.2018: CG Vyapam has released the ADEO Exam Final Answer key on the Official Website…..Download it through the Link given below…. Chhattisgarh Professional Examination Board Chhattisgarh has announced the Recruitment of 213 Posts of Sahayak Vistar Vikash Adhikari/ Assistant Development Expansion Officer (ADEO). Many Candidates who is Interested in above Vacant Posts filled there Online Application Form. Candidates Submitted there Online Application form till the Last date 22-09-2017. Candidates Can Check the Detailed Recruitment from the Below Provided Link. About Exam : All the Candidates who filled there Online Application Form Successfully gave the Exam. The Exam was written Objective type and Conducted on 29 October 2017. The Exam was of Total 150 Marks/ Questions. The Time Duration for the Examination will be 03 Hours. There was a Negative marking of 0.25 Marks for each Wrong Answer. Answer Key : The Exam was Conducted Successfully and Now all these Candidates are waiting for there Result. Soon the Result will be Announce on the Website but before Providing the Result CGPEB Will Provide the Answer Key of ADEO exam. The CG Vyapam ADEO Answer Key is Available now On The Official Website Of CGPEB. Candidates be in touch with the website and Also should download there Answer Key from the Below Provided Link. Objection Form : All the Candidates Now Checking there Answer key. Some of these Candidates have issues with the Provided Answer Key So all these Candidates can fill the Objection form against the Provided Answer Key. The Details about the Objection Form will be Available on the Official Website of CG Vyapam. Final Words : The Candidates can get any kind of alert easily from Our Website (www.jobriya.in) for this the candidates need to Bookmark us by pressing Ctrl+D regarding the admit card, result and other related information. Chhattisgarh Professional Examination Board (CG Vyapam) has recently announce about the Recruitment of 88 Posts of Revenue Inspector & Zonal Coordinator. Many Interested & Eligible Candidates Filled there Online Application form for the Above Vacant Posts. The Process of Submitting the Online Application Form is Started from 01.03.2018 and Will be Conducted till 16.03.2018. More Details About the Recruitment is as Provided Below. All the Eligible Candidates Who Filled there Online Application form will Face the Exam of CG Vyapam Revenue Inspector & Zonal Coordinator. The Exam Will be Conducted on 15 April, 2018 (Sunday). The Exam Will be Written Type. Those candidates who are ignoramus about the scheme/pattern and syllabus of this written exam and worry about their preparations. They can get the latest prescribed exam pattern and syllabus for the Exam of Revenue Inspector from here. The Question Paper will be of Total 150 Marks. The Question Paper will be of Total 150 Questions. The Duration of Test will be 03 Hours. 01 mark shall be awarded for every right answer and 1/4 deducted for wrong answer. General Knowledge of Computer : Usage of Computer, Parts of Computer, Usage of Antivirus, Internet Usage, MS PowerPoint, MS Office, Computer Software & Hardware, MS Word, Windows & MS Excel etc. General English With Grammar : English Grammar- Number, Gender & Articles, Pronoun, Adjectives & Verb, Use of Some Important Conjunctions/ Prepositions. Transformation of Sentences- Active Passive Voice, Direct Indirect Narration. Vocabulary- Synonyms/Antonyms, One Word Substitution & Spellings. General Mathematics : Algebra : Rational Number & Expressions, Surds, Indices, Loast, Percentage, Simple & Compound Interest, Averege, Time-Duration, Ratio and Proportion, Polynomials, Quadratic Equations, Arithmetic Series, Linear Equation. Trigonometry. Geometry : Fundamental concepts of Geometry, Different theorems and/or axioms and their converse. Co-Ordnate Geometry. Mensuration, Statics, Line and triangle, angle, cylinders, cube, dense, Cone, Circle, Buy-Sell. General Mental Ability : Spatial Orientation, Problem Solving, Analysis, Visual Memory, Analogies, Decision Making, Arithmetical Reasoning, Ranking, Coding and Decoding, Space Visualization, Figural Classification. Relationship Concepts, Arithmetic Number Series & Statement Conclusion etc. Candidates Can Bookmark (WWW.JOBRIYA.IN) us for regular updates regarding CG Vyapam Revenue Inspector, Zonal Coordinator Exam Syllabus & Other Related Information. Candidates can share their queries related to CG Vyapam Revenue Inspector Syllabus 2018 through the comment box given at below. We will try give appropriate response to your queries. Chhattisgarh Professional Exam Board (CG Vyapam) has recently announce about the Recruitment of 88 Posts of Revenue Inspector & Zonal Coordinator. Many Interested & Eligible Candidates Filled there Online Application form. The Process of Submitting Online Application form is Started from 01.03.2018 and Was Conducted till 16.03.2018. More Details about the Recruitment is Provided Below. All the Eligible Candidates Who Filled there Online Application form face the Exam Successfully. The Exam Was Conducted on the Date 15.04.2018. The Exam Was Written Type with 150 questions of 150 marks the Time Duration for the Exam was 03:00 hours (180 minutes). More Details About the Exam is Provided Below. Result for the above mentioned Exam will be announced Shortly. Successful Candidates will be intimated through Email or SMS to their Registered Mail Id or Mobile No. You can check Result & Get Updates through this Page also. Keep in touch with us for more updates. Selection Process for CG Vyapam Revenue Inspector is quite simple like any other Selection Process. First Stage is Written Exam & then Interview. CG Vyapam hold the right to conduct necessary test for Selection. All Aspirants who are in need of Result for this Exam advised to stay connected with us through this Page or follow official CG Vyapam website for Latest News, Updates Regarding Answer Key. You can also get a Direct Link from here to Download Answer Key & Check Result. You can also get updates regarding Answer Key & Result of other known Exams from our website (www.jobriya.com). Keep in touch with us by Just adding a “Bookmark” to our website. Candidates can drop their valuable comments in the comment box. Candidates can share any query/ question regarding this post. Our Panel will be happy to assist you. Latest Updated on 27.03.2018 : CG Vyapam has released CG SET Exam Result….Now You Can Check Your Result Through The Link Given Below……. Chhattisgarh Professional Examination Board Chhattisgarh (CGPEB) has recently announce about the Chhattisgarh State Eligibility Test (SET) for the Session of 2017-18. Many Interested Candidates Filled there Online Application form. The Last Date of Submitting there Online Application Form is 11 August, 2017. About Exam : All those Candidates who filled there Online Application form gave there Exam Successfully. The Exam was written Objective Type and Conducted on the Date 17 September, 2017. The Exam was Divided into three Papers. First Paper & Second Paper was of 100 Marks and Third Paper was of 150 Marks. There was no Negative Marking. Result : All the Candidates who gave the exam of CG SET are now waiting for there result announcement. So those candidates have some more patience because soon the CGPEB will declare the result. Result is very important for every individual candidates. So it is natural that all candidates are waiting for the results desperately. Soon we will also upload the result of exam of CG SET so the candidates can check the result directly. Remarks : All the candidates are advised to be in touch with the official website of CGPEB & Visit this Page Regularly and Also can bookmark our website (www.jobriya.in) so that they will get all the latest updates about this post and other related to Exam, Result and Other Related information.